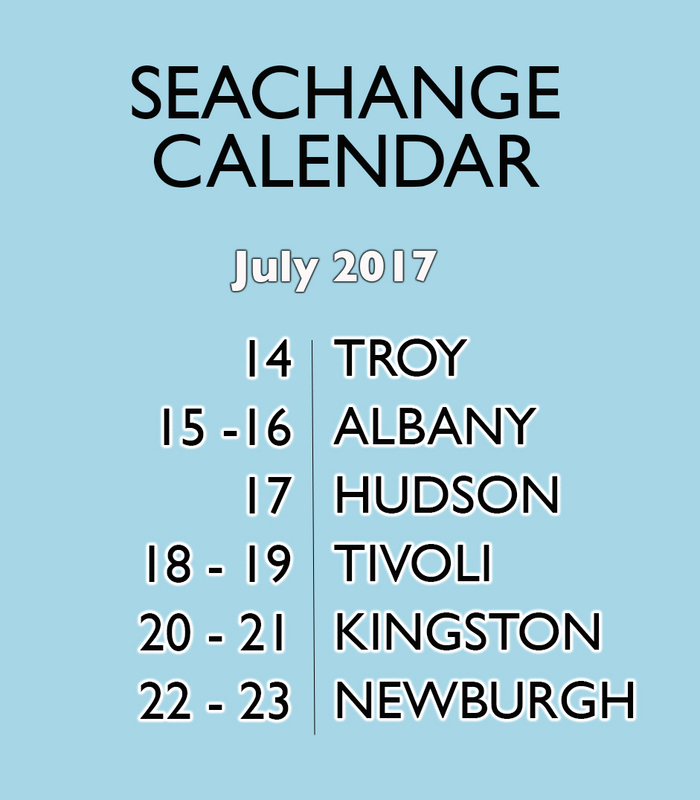 In 2014, the SeaChange Project formed around the desire to innovate new artistic forms to support the protection of the Hudson River watershed and to gather localized community struggles into the frame of the global climate crisis. The SeaChange Voyage – after organizing a series of community boat-builds – embarked down the Hudson River from Troy, New York, to Manhattan in their new flotilla of handmade paper boats. As it traveled, this arts-organizing project called attention to some of the local causes and impacts of climate change, such as sea-level rise along this long tidal estuary. Along the journey, SeaChange convened 12 community meet-ups, performances and potlatch feasts, mobilizing more than 1,000 people to join the People’s Climate March that would occur a few weeks later and making news in dozens of local media outlets along their voyage. Upon our arrival in New York City, we organized gatherings, lectures, round-tables and a circumnavigation of Manhattan to share stories about what we had encountered on their journey, connecting the stories of local organizing along this long energy supply-chain. In 2014, we found that our project captured the imagination of thousands of people along the tidal Hudson River estuary, brought together diverse local issues into a common narrative and mobilized people towards engaged action. We realized that the connection one gained by traveling directly on the river deepened participants own commitment to protecting its beautiful waters. As we continue this transformative project, we hope to deepen people’s own commitment to defending our common waters through creating spaces for personal and collective engagement with this majestic river. SeaChange Mohawk Water Protectors speak with @citizenactionny in Kingston protesting outside the office of John Faso and in mobilizing for their Citizens March on August 12.